Transferring can be a stressful, but very rewarding process. I had my sights set on a top 30 school that I had not gotten into the first time around, and although I was very happy with the school I chose to attend for my 1L year, I figured I would give the high-ranked school another try. I thought I would share a bit of information with you so that if you intend to transfer or are considering it, you will know what you're in for. You will use the same system you used to apply for your 1L year (LSAC). Each school will post their transfer application sometime in the spring. Your law school transcript will need to be uploaded as well as updated letters of reference. These things can be uploaded to the LSAC system prior to the transfer application opening, and it often takes time for the school to submit your transcript, so I would recommend getting on top of this early. The school will likely ask you to supplement your application once your final 1L grades are released. Congratulations on getting into law school! It is a huge accomplishment, and though you have a lot of work ahead of you, make sure you take time to celebrate all that you have done to get to this point. 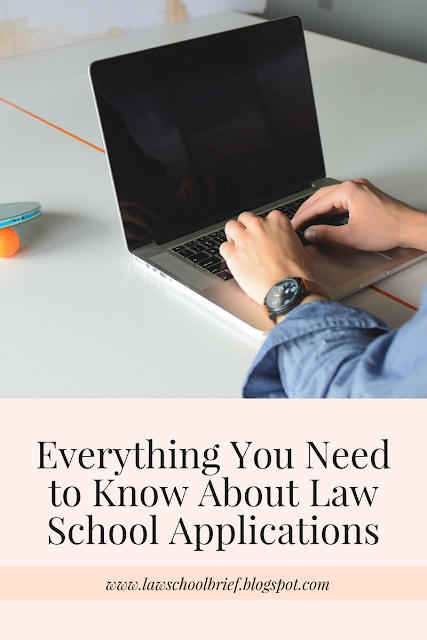 There are many things to consider when choosing between law schools. I will start by sharing some advice I received from multiple attorneys. This advice comes from an attorney who has operated his own practice for many years and another who is currently an attorney at Microsoft. 1) Go to school in the state you want to practice in. Though you will not be learning state-specific material for the most part, you will be making a TON of connections while you are in law school. A majority of the attorneys you will network with at events will be from that state, and companies often recruit from the schools within their own state. You will have a much better chance of receiving a job or internship from someone you have met with face-to-face. Court opinions are often included in your casebook to strengthen your understanding of a certain topic. I recommend briefing every case for your first semester. 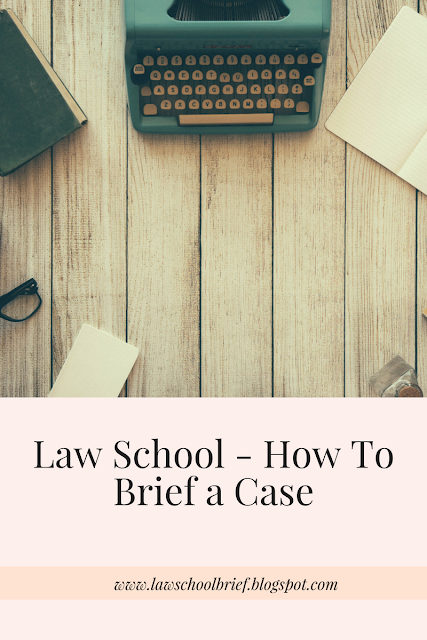 I would recommend briefing every case for the first few weeks of each semester after that, since each new subject will be unfamiliar at first. Here is an example of a case brief. I include these in my reading notes. Case Name, Court, Year FACTSPROCEDURAL HISTORYRULEREASONINGHOLDING As I read the case, I fill in each section. FACTS: The first two facts I include are the parties. Identify who is the plaintiff and who is the defendant. Then explain what the case is about (what happened that brought them into court?). PROCEDURAL HISTORY: The opinion you are reading is from an appeal. The court will briefly discuss what happened in the lower court. Include that information here. Getting In: Should I Take Time Off After Undergrad? Taking time off after undergrad was one of the best decisions I made. 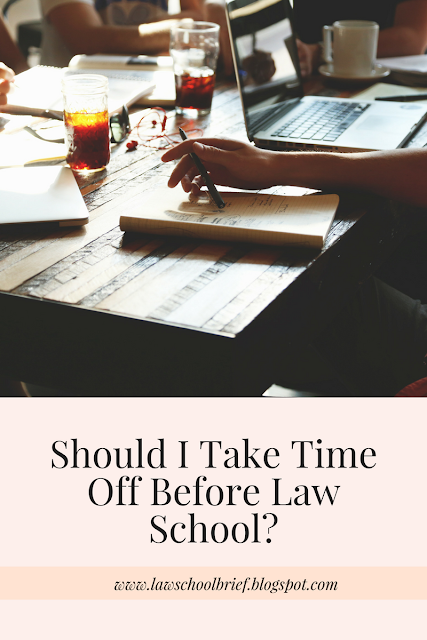 I had time to take on more responsibilities at the law firm I was working at, and that experience prepared me for law school. You can spend more time studying for your LSAT. I had four classes, jobs, and extracurricular activities my senior year of undergrad, so LSAT studying became last priority. During my year off, I was working full-time, but I still had more time in my schedule to dedicate to studying. I found it more beneficial to study in small increments over a longer period of time, rather than cramming for a month while juggling four other courses. 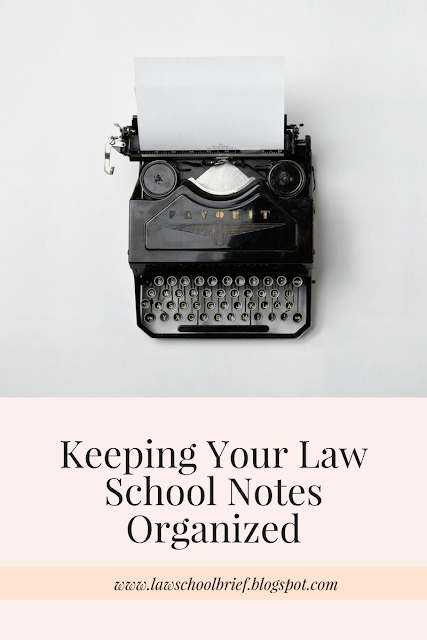 If you have not started law school yet, you will soon learn that you will take more notes in a class than you probably ever have in any undergrad course. All of the notes and topics need to be kept in an organized fashion so that when you start studying, you don't have to re-organize everything. 1. Take notes from the reading assignments; I type these because they are significantly longer than my in-class notes. 2. Take hand-written notes in class; numerous studies have shown that hand writing notes helps the information stick in your brain. 3. Take notes in tutoring sessions. 4. Print any slides and teaching documents offered by the professor. 5. Save any worksheets or handouts from class. 1. Create a file for each class. 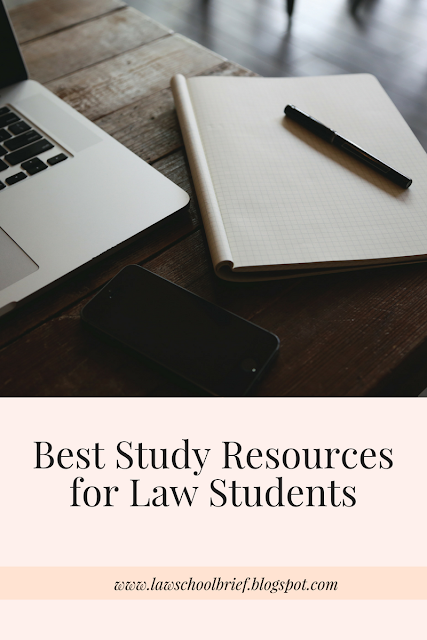 Supplemental materials will be your BEST FRIEND in law school. The one that I swear by is Quimbee. It includes videos that explain a majority of the topics you will be covering in your first year courses. It includes multiple choice quizzes and tests throughout the lessons to test your understanding. These lessons make the complicated topics seem extremely simple. I watched these and took quizzes throughout the school year, and I reviewed certain videos before finals week to refresh my memory. Each video is about 5 to 7 minutes, but there are a lot of them. I would not plan on cramming these into the weekend before finals. I received a card at orientation for a 3 month free trial, so be on the lookout to see if you get one of these. I believe you can get a 7 day free trial, so test it out to see if it fits your learning style. If it does, I strongly recommend investing in this and working it into your budget. If this works for you, the payoff will be huge. Choosing which schools to apply to can be a difficult process. There are often small fees associated with each application, but they add up quickly. If you are approaching the deadlines, you may not be able to submit a few and await their responses before submitting more. I ran into this issue, and because I was somewhat paranoid about not getting into the schools I wanted, I applied to a handful of other schools that I was not particularly interested in. To avoid the extra costs, apply early to a few schools that are at the top of your list, wait for a response, and then start applying elsewhere if needed. You can filter schools by LSAT score or by GPA. I created a list of schools using an LSAT range that included schools that were a few points below and a few points above my actual score. From there, I started crossing out schools I had no interest in.